Successfully Added 2.4GHz Wireless A/V Kit - Wireless Signals To AV Devices to your Shopping Cart. Wireless security receiver kit for receiving wireless transmissions from 2.4GHz wireless cameras and displaying them in high quality definition on A/V devices such as TVs, DVDs, VCRs or other AV devices with standard RCA connections. 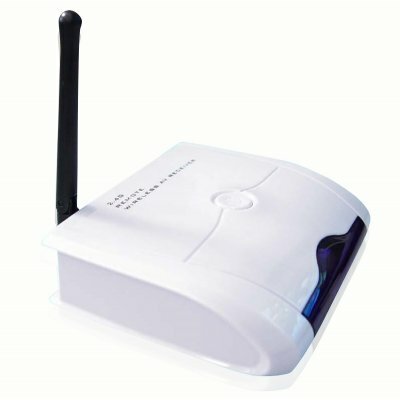 A perfect choice for affordable and easy to set up security system, this wireless receiver comes with 4 selectable channels for multiple wireless cameras, long range reception with the high powered antenna, and easy control via remote or touch control. Purchase yours today!. can this device be used as a recieverfor your wireless cameras.